JERRY'S BEST BETS : Nideeb lands the winter Derby !!! Nideeb lands the winter Derby !!! 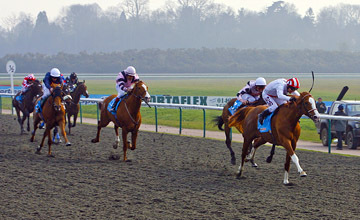 PHILIP ROBINSON, 50 years young, got his new partnership with Clive Brittain off to a perfect start at Lingfield on Saturday as he ran out a clear winner of the Winter Derby on Nideeb. It was the pair's first winner together since joining forces in February after Robinson left the employment of the retiring Michael Jarvis after two decades of service, although the association between Robinson and Brittain stretches back to the 1980s. Robinson said: "It's nice to get the ball rolling. I hope he's improving and hope he can be classy on the grass. He could make up into a very nice horse." Robinson demonstrated some of what he had learned in a long and successful career in a supremely confident ride on the 9-4 favourite. He raced in a share of second - alongside Pachattack - in the early stages while Suits Me cut out a decent pace up front. Robinson made his move on the turn to home, producing Nideeb to lead at the head of the straight and quickly opening up a two length gap as his rivals, who were frankly not in the same class as the winner, struggled to compose an adequate response. Nideeb wandered slightly around the one furlong mark, giving the briefest glimmer of hope to the running on veteran Dansili Dancer, but that was snuffed out as the Brittain horse found his footing and came home a length and a half clear.Pachattackwas some distance behind in third. "This was the plan for some time. I'll discuss things with [owner] Saeed Manana, but wouldn't be surprised if he went for Group 1 races," said Brittain. "He's a useful horse and there are races in Turkey worth a lot of money. With prize-money as it is here I'm forced to go abroad."